Parathas are quite a versatile category of Indian bread, and can often combine several textures and flavours into one serving! 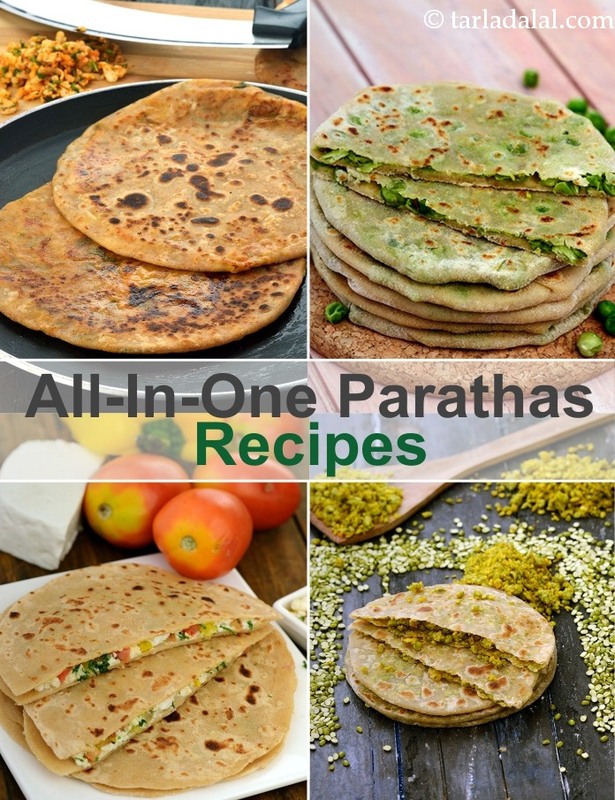 You can combine vegetables, dals, pulses and spices with the dough or as a stuffing, to make delicious treats like the Dal Paratha, Green Moong Dal and Spring Onion Paratha, Green Peas and Carrot Paratha, Masala Tomato Onion Paratha. Serve with a subzi or a cup of curds and pickles to make a delicious meal. People coming over for high-tea? these savory parathas in a smaller size will make an ideal snack. Peas and spices are pureed and mixed into a stiff dough and flattened into small parathas and cooked. They taste fabulous as is, with no accompaniment. Go ahead and indulge! A novel paratha, stuffed with chinese stir-fried vegetables. While making the stuffing for the oriental style stir-fried vegetable paratha, make sure you do not over-cook the vegetables, to maintain the perfect stir-fry texture and flavour. These paratha are made with a combination of oats and wheat flour to initiate you to the taste of fibre filled oats. I have used the spring onion filling as it helps to disguise the raw taste of oats. These ar best served hot.